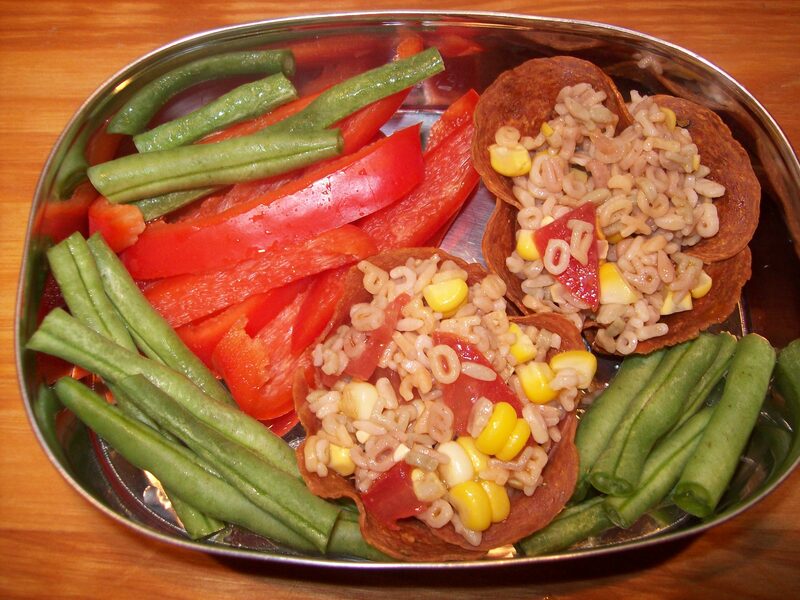 Salami cups filled with simple pasta salad, alongside bell peppers and green beans. You know what’s fun? Giving your kids something they really, really like to eat for lunch. You know what’s even MORE fun? Giving them that same item, in a way they’ve never seen before. Salami cups were just me playing around in the kitchen. I’ve seen people make edible cups out of the craziest things, and I’ve experimented with cookie cups and the like before — but never a MEAT cup. Turns out, if you layer nitrate-free salami slices in muffin tins and bake them, you get crispy little baskets you can fill with all kinds of things. Since P. loves nitrate-free salami and pepperoni above almost all other lunch items, it seemed like a good way to not only switch things up a little for him, but bulk up the cured meat (not, obviously, the world’s MOST optimal health food) with some more nutritionally solid players. Both boys loved these salami cups when I filled them with a simple pasta and vegetable salad. The lunchboxes came home empty that day. Preheat oven to 375 degrees. Arrange four slices of salami in each of six muffin tins, overlapping them slightly in the bottom so that they fan up the sides to create a cup. Fill each lined muffin cup about halfway with dried beans to weight down the salami and help the cups form. Bake the cups at 375 degrees for 10-15 minutes, until crisp but not dark brown. Remove from the oven and allow to cool before carefully discarding the dried beans (do not use again) and removing the salami cups from the tins. Fill with anything you like — pasta salad, rice, vegetables, fruits. Combine all ingredients in a medium bowl, tossing well. Taste and adjust for seasonings. Serve at room temperature. I assume you can make the cups the night before and refrigerate, right? Yes — in fact, you can make these several days in advance. They’ll keep for up to a week refrigerated, so they’re very handy!